Both of these high-yield midstream companies have cut their dividends and are now back to dividend growth, but is one better than the other? Kinder Morgan (NYSE:KMI) and Williams Companies (NYSE:WMB) have strikingly similar dividend histories, with each taking a knife to their disbursement in 2016. At this point, however, both are back on the dividend growth path. A little history will help investors decide which is the better buy. Kinder Morgan's 2016 dividend cut was announced in late 2015. It made the difficult choice to reduce its dividend by a massive 75% so that it could put that cash toward growth projects. Without a question it was the right move for the company, even though income-focused investors were highly displeased. The problem with the cut is that investors were blindsided by the decision. Why? Because on Oct. 21, management increased the dividend, affirmed its dedication to paying a growing dividend, and announced that it planned to increase the 2016 dividend by as much as 10%. Just 45 days later, on Dec. 4, it announced that it could afford to pay the dividend but that that cash could "alternatively" be used to support growth efforts. On Dec. 8, it announced that the dividend would be slashed. There's a trust issue here that investors should keep in the back of their minds. There was a lot of news surrounding Williams Companies in 2016. It had agreed to be bought by Energy Transfer in late 2015 for $37.7 billion. That deal required Williams to call off its purchase of Williams Partners, its controlled limited partnership. Energy Transfer, however, got cold feet and in 2016 it worked very hard to scuttle the deal. Although Williams did its best to see the deal through, including going to court, it couldn't salvage the agreement. Following the news that the Energy Transfer deal was done, Williams cut its dividend so that it could use that cash to support growth at its controlled limited partnership. This was a vastly different situation from what transpired at Kinder Morgan. And, when Williams announced the cut, it stated that the plan was for dividend growth to resume in 2018. Only that goal didn't pan out -- because Williams increased the quarterly dividend by 50% in March 2017, well ahead of time. 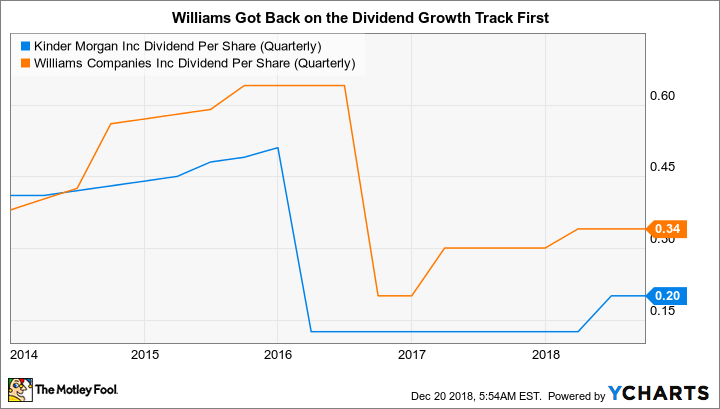 In 2018 the dividend was increased again and the company finally bought out Williams Partners, essentially getting itself back to where it wanted to be before the botched Energy Transfer deal messed things up. KMI Dividend Per Share (Quarterly) data by YCharts. Although a dividend cut is never a welcome event, the actions Williams decided on during a difficult and complex period look far better in hindsight than the moves Kinder Morgan chose to make. That said, Williams' own role in the Energy Transfer deal shouldn't be ignored -- it didn't have to agree to be acquired and could have walked away from the doomed deal much earlier than it did. At this point Kinder Morgan has plans to increase its dividend by 25% in 2019 and 2020. Driving that growth will be $6.5 billion worth of growth projects that have completion dates through 2020. Although it hit a snag with a major project in Canada that's since been sold, Kinder Morgan looks like it can live up to its dividend growth promise. After all of the dividend hikes, using today's stock price, Kinder's yield will be around 7.5%. Williams, meanwhile, is still doing some portfolio reshaping after its acquisition of Williams Partners. However, it is projecting dividend growth of 10% to 15% in 2019 backed by growth spending of around $2.6 billion. Using today's stock price, that would put Williams' yield at around 7%. Comparing the histories here, Williams comes out looking much better. The slightly higher projected yield at Kinder Morgan isn't enough to give it an edge over Williams in my book. And for that reason, I would pick Williams out of this pair. That said, there are similarly large and financially strong midstream companies that didn't cut their disbursements, including companies like ONEOK and partnerships like Enterprise Products Partners and Magellan Midstream Partners. Before buying either Kinder Morgan or Williams, you should compare them to these other midstream names. There's a good chance you'll find alternatives with better track records. In other words, I like Williams better than Kinder Morgan, but neither one's a better buy than some of the other players in the midstream space.